Shoulder Bolt Gaging for Mold Insert | Cincinnati Automation Ltd. 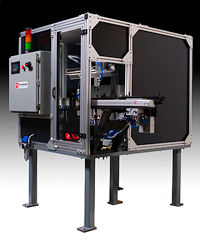 This machine was designed to be used to automatically feed and laser gage two sizes of shoulder bolts for molded grab handles. Omron lasers were used to verify correct bolt length and OD prior to loading bolts into a dual part nest. Rejects were ejected into a containment bin inside of the machine. Correct size bolts were loaded one at a time into four positions in a nest plate attached to a servo actuator. The machine PLC signaled the injection molding machine robot when four bolts were in position and ready for pickup. The bolts were then over molded into the plastic grab handles and the process repeated. Machine functions were displayed on an HMI.